THE FIRST FERRARI wasn’t called a Ferrari. Yet it is quite an automobile with a tale to tell. 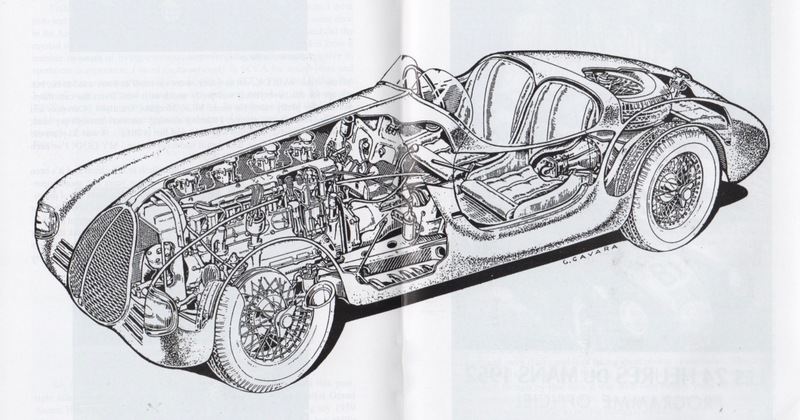 What’s more, Jim Donick, editor of Vintage Sports Car, the quarterly magazine of the Vintage Sports Car Club of America, chose a fine cutaway by G. Cavara of this 1940 Auto Avio Costruzioni Tipo 815 for the club’s Number Three 2018 issue. Auto Avio Costruzioni Tipo 815. Illustration by G. Cavara from Vintage Sports Car, Number Three 2018. Thanks, Jim and Signor Cavara, for reminding me of another reference to this car, Phil Hill’s article “The First Ferrari,” published in R&T, January 1992. 1940 Auto Avio Costruzioni 815. This and the following images by John Lamm from R&T, January 1992. Why Not a Ferrari? Enzo Anselmo Giuseppe Maria Ferrari had worked for Alfa Romeo from 1920 to 1939, first as a racing driver, later as manager of Scuderia Ferrari, Alfa’s official race team. 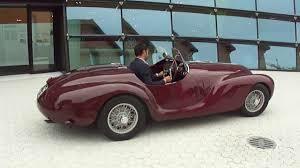 Ferrari left Alfa Romeo in 1939, forbidden to restart Scuderia Ferrari for four years. Instead, he established Auto Avio Costruzioni, as its name suggests, a manufacturer of speed equipment and aviation parts. 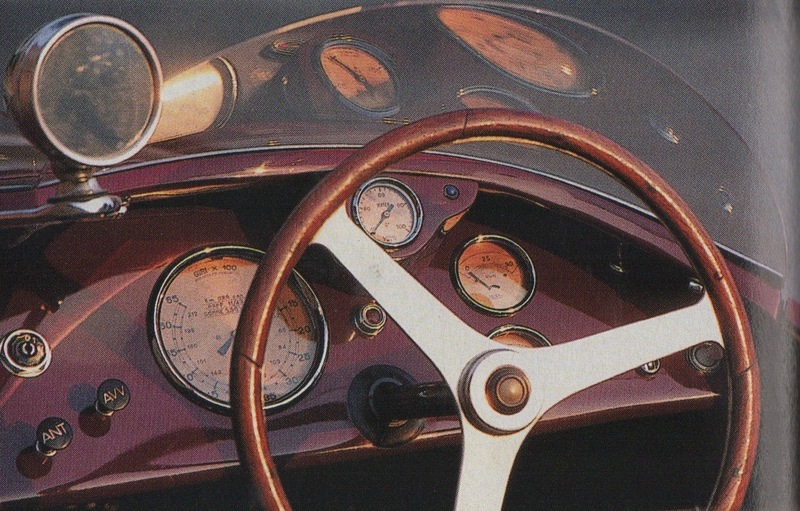 An Offer for the 1940 Mille Miglia. In late 1939, race driver Alberto Ascari and the Marquis Lotario Rangoni Machiavelli di Modena (what a great name!) offered Ferrari a deal he could not refuse: Build a pair of cars for the 1940 Mille Miglia. The car could not be badged Scuderia Ferrari. So Ferrari hedged by giving it his current company name, Auto Avio Costruzioni. A model designation 815 indicated that power came from a straight eight displacing 1.5 liters. A subtle dig at his previous employer? The famed Alfa Romeo Alfetta 158 was so named for its 1.5-liter straight eight. Not a Proper Mille Miglia. Actually, the 1940 event wasn’t a Mille Miglia in the tradition of Italy’s famed cross-country race begun in 1927. An accident killing ten spectators in the 1938 Mille Miglia led to cancellation of the 1939 running. And, in 1940, it was replaced by the Gran Premio di Brescia della Mille Miglia, a 103-mile triangular circuit, lapped nine times, with Brescia, Cremona, and Mantova as its apices. Construction of Ferrari’s two Auto Avio Costruzioni 815s was hasty indeed, leading to neither finishing the Gran Premio di Brescia della Mille Miglia. A BMW 328 won; Alfas and BMWs were second through eighth; two Stanguellinis completed the top ten of 40 finishers. The pair of Auto Avio Costruzioni 815s survived World War II. One was scrapped in 1958; the other, owned by Italian Mario Righini for years, is on display at the Casa Natale Enzo Ferrari Museum in Modena, Italy. 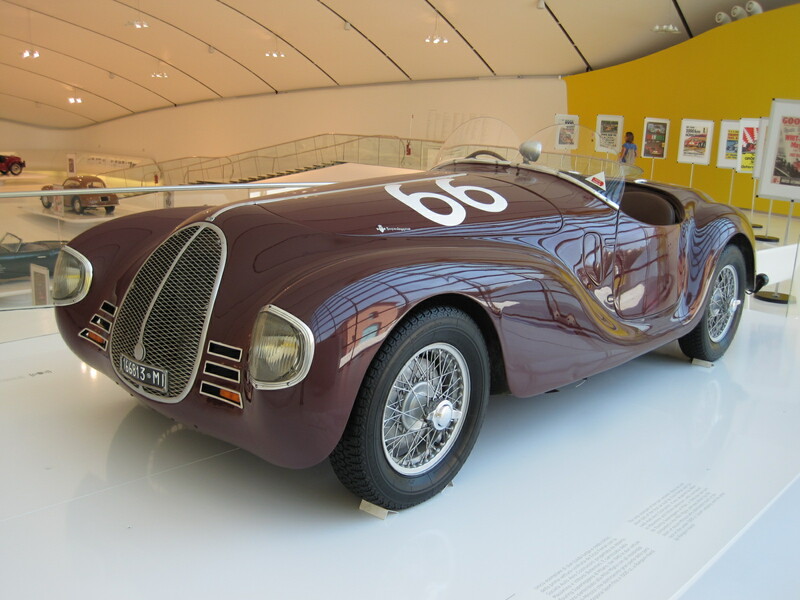 The surviving example of two, as seen in the Casa Natale Enzo Ferrari Museum, Modena, Italy. Image by Arnaud 25. Auto Avio Costruzioni 815 Technology. 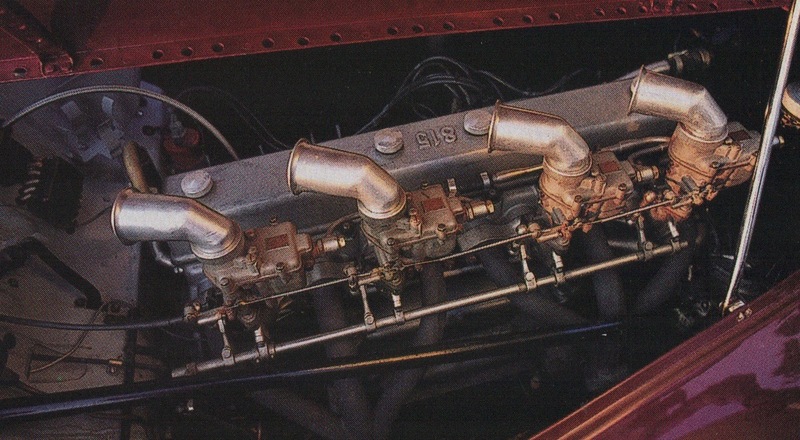 The Auto Avio Costruzioni 815’s straight-eight engine evolved from two Fiat 508C Balilla four-cylinder powerplants aligned end to end. A Bolognese foundry cast an eight-cylinder block based on this idea. Two actual 508C heads are fitted. Valve gear and connecting rods are also Fiat-supplied. Four Weber 30 DR 2 carburetors provide fuel and air; a Marelli distributor, the spark. An Auto Avio-designed crankshaft and single overhead camshaft completed the diminutive straight eight. The gearbox was from Fiat, with cogs replaced by those of Auto Avio fabrication. Displacing 1496 cc, the engine produced 75 hp at 5500 rpm. The 815 had a top speed approaching 110 mph, impressive for a 1.5-liter car of the era. The 815’s suspension featured a live axle on semi-elliptic leaf springs at the rear. 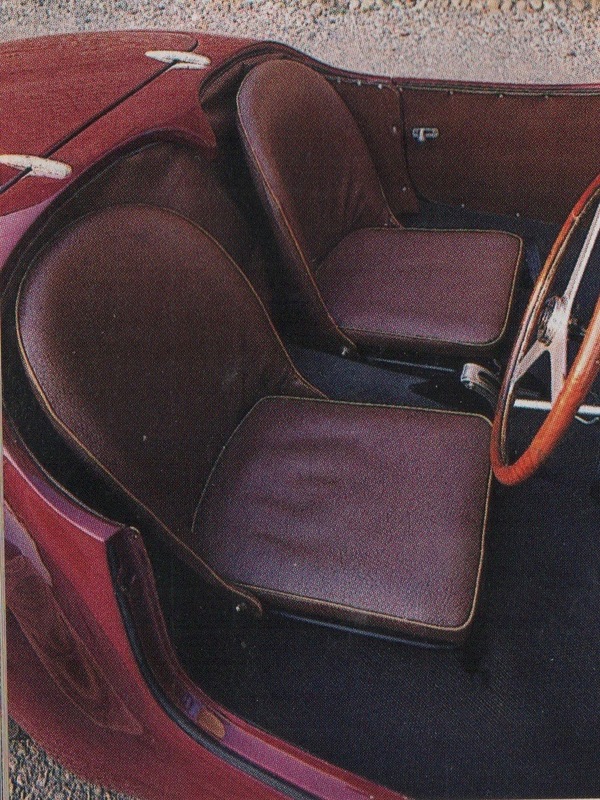 Its independent front suspension used the Dubonnet concept, with coil springs and shocks in oil-filled housings. Efficacy of the suspension was displayed at the Brescia race with a class record lap of more than 91 mph. A Modense Beauty. 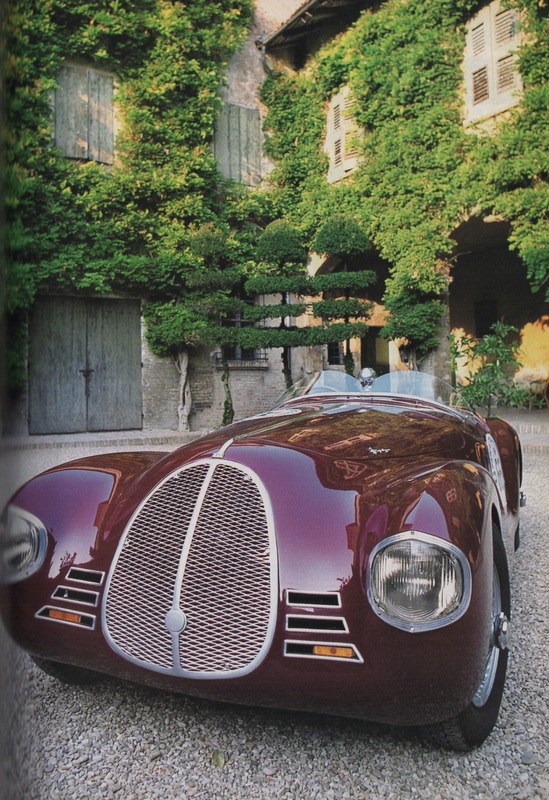 The Auto Avio Costruzioni 815 has barchetta coachwork by Carrozzeria Touring. Its body of Itallumag, an aluminum/magnesium alloy, weighs only 119 lbs. Overall weight of the 815 is 1378 lbs. The sight—and sounds!—of the Auto Avio Costruzioni 815. Video by Andrea Manieri. I saw this car when I visited the Righini Collection. At the time, M. Righini said that the Ferrari Museum had a ‘replica’ of this car and often offered to buy the original. It’s fu to learn about the mechanicals. Aha. None of my sources suggested a replica in the museum. I wonder if the offer was ever realized? Whether the first Ferrari to carry the name (chassis 01I) still exists is subject to some debate. The Petersen Museum displayed a 125S, called chassis number 01C when displayed at Pebble Beach, at their “Seeing Red” exhibit. Now owned by Roger Willbanks, it is currently in the Vault at the Petersen. Wikipedia (citing no sources) says this may be one of the two original Ferrari 125s. or assembled from pieces of them. 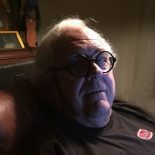 Thank you, Jim, for the continued excellence of VSC. This entry was posted on November 2, 2018 by simanaitissays in Classic Bits and tagged "The First Ferrari" Phil Hill John Lamm R&T January 1992, "Vintage Sports Car" Jim Donick VSCCA, 1940 Gran Premio di Brescia della Mille Miglia, Andre Dubonnet suspension, Casa Natale Enzo Ferrari Museum Modena Italy, Fiat 508C Balilla, first Ferrari: 1940 Auto Avio Costruzioni 815.